The quality of blackjack games in Las Vegas has declined over the past 15 years. The availability of strategy information over the internet has forced casinos to drop some of the more liberal rules. Casinos first started hitting on soft 17. Some stopped offering surrender or re-splitting aces in shoe games. The biggest rule change that goes against players was rolled out first at single deck games. This terrible rule started paying players 6:5 on a blackjack, as opposed to 3:2. This means that a $10 blackjack would pay $12 instead of $15. Once the casinos got away with this at single deck games, the 6:5 rule started infecting double deck and shoe games. While some Las Vegas casinos offer terrible rules on blackjack these days, there are still several places where a good game may be found. Some are even on the Las Vegas Strip, although some of the better ones are located downtown or in the locals market. All of the games mentioned below pay 3:2 on a blackjack. Treasure Island is the best Las Vegas Strip casino for blackjack. Players will find $10 games with great rules. The shoe games offer surrender, re-split aces, and double down after splitting. The double deck games allow double down after splitting. These low limit games hit a soft 17. Players willing to move up to $50 can move to the high limit salon. They will get a shoe game with double down after splitting, re-split aces, and surrender. The dealer stand on all 17’s in this game. The high limit double deck starts at $50 and allows double down after splitting. The dealer stands on all 17’s. SLS Las Vegas spreads good $15 blackjack dealt from a shoe. Players can double down on any two cards and after splitting. Surrender and re-split aces are also permitted. The dealer hits soft 17. This game is offered in the high limit salon for $100 where the dealer stands on all 17’s. Aria, Mirage and MGM Grand offer the same games hot on soft 17 games as SLS Las Vegas for $25. For $50, MGM Grand and Bellagio offer it where the dealer stands on all 17’s. It is $100 at Mirage and $200 at Aria and Mandalay Bay. A $100 minimum will get a double deck pitch game at Mirage and MGM Grand where players can double down after splitting and the dealer stands on all 17’s. Aria and Bellagio have this game for $200. El Cortez offers the best blackjack game in downtown Las Vegas. It is a single deck that pays 3:2 on a blackjack. Players can double down on any two cards and the dealer hits soft 17. The minimum bet is usually $5. Be careful in this game as the pit bosses will sweat large action or bet spreads. Downtown Grand offers the best shoe games downtown. For a $5 minimum, players can double down after splitting, re-split aces and surrender. Plaza offers regular $5 blackjack that pays 3-2. Players can double down on any two cards and after splitting. This game can also be found at Golden Gate during slow periods. The competition in the off-strip blackjack market is fierce. 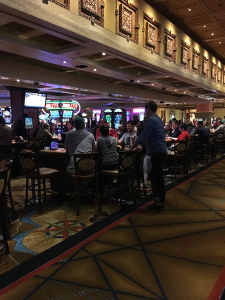 Players will be able to find shoe games that start at $5 or $10 where double down after splitting, surrender, and re-split aces at are allowed at Cannery, Eastside Cannery, Rampart, Aliante Casino and Arizona Charlie’s. All Station Casinos properties offer this game without re-split aces. The dealer hits soft 17 in these games. M Resort offers a $50 double deck game where players can double down before and after splitting, as well as re-split aces. This game stands on all 17’s This is the best blackjack game in Las Vegas. There is also a six-deck shoe game that adds surrender. Station Casinos properties offer double deck blackjack where players can double down after splitting. M Resort offers the same game. The dealer hits soft 17. Suncoast, The Orleans, Gold Coast, South Point and Silverton also spread this game. El Cortez offers the best video blackjack machine in Las Vegas. It hits on all 17’s, allows surrender, and splits up to three hands. Double down on any two cards and after splitting is permitted. The minimum bet is just $1. This El Cortez game also accepts a players card for comps and points on this machine.